A dog feeding schedule for your Weimaraner dog should not be hard to establish. The schedule should be based on your needs and those of your dog. When doing so, it’s important to remember that a puppy feeding schedule will be different from adult dog feeding! As your dog gets older, he will be able to wait longer between meals. Dog Feeding Once a Day? Years ago the custom was to feed a dog once a day–often in the morning. However, the thinking on once a day feeding has changed somewhat in recent years. While feeding your dog once a day may be more convenient for owners, the general consensus today is that it is better to feed an adult dog twice a day. For people who work and are absent from the home all day, this is a convenient schedule, and one that is also good for your dog. 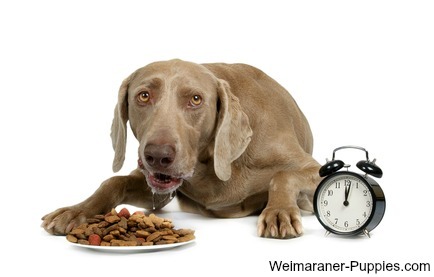 If your Weimaraner is on a feeding schedule,he will know when it is time to eat! Dogs are creatures of habit. Because of this, it is best to feed your dog at very specific times. He will be fine with this, and his body will adjust to your schedule. In fact, when mealtime rolls around, your dog will eagerly let you know that it is time! Your dog will adjust to his feeding schedule and will expect to be fed at his regular times. If you are home, he may even come to remind you that it’s time. Usually dog owners feed their dogs early in the morning, then again in late afternoon. This seems to work out well for both owners and dogs. Remember that your dog will need to go outside approximately an hour after eating. A dog’s digestive system works fast and is very predictable. Letting your dog outside to “go” at the right times, will help him to avoid accidents in the house. Works Best for You?So, when you are considering how to feed your dog, consider carefully what will be best for both you and your dog. Does a dog feeding schedule work best for you or will you do better with feeding on demand? Whatever you decide, work your dog gradually into the system, and stick with your decision so your dog won’t be confused by inconsistency. And always make sure that you are giving your dog a high quality dog food. 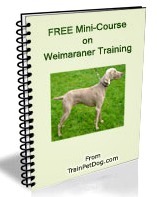 Learn more about Weimaraners and get a free mini course on Weimaraners.